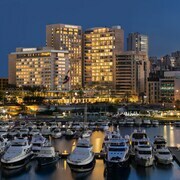 Located in Beirut Central District, this luxury hotel is within a 10-minute walk of Beirut Corniche and Zaitunay Bay. Hamra Street is 1 mi (1.6 km) away. This hotel is not Four Season Hotel for sure, Old Furniture in the room. The hotel does not have anything except a coffee shop in the lobby. 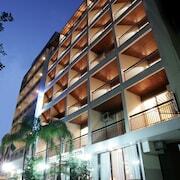 This is not considered as a 5-star hotel no way,.. 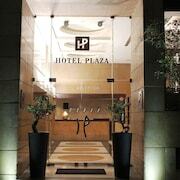 Located in Hamra, this hotel is within 1 mi (2 km) of Lebanese American University and Hamra Street. Zaitunay Bay is 1.4 mi (2.2 km) away. 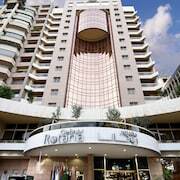 This family-friendly Beirut hotel is located near the airport, within 1 mi (2 km) of Martyrs Square and Zaitunay Bay. Hamra Street is 1.2 mi (2 km) away. Good value hotel The hotel does not look much from the outside but it has good sized clean rooms. Helpful staff and a reasonable buffet breakfast. Its out of town but on a very good bus route. There are security staff and a guarded car park though its full of pot holes. 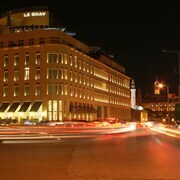 Located in the heart of Beirut, this luxury hotel is within 1 mi (2 km) of St. Maroun Church and Zaitunay Bay. Hamra Street is 1.3 mi (2.2 km) away.